Racing Club Warwick put the disappointment of their FA Cup and Vase exits behind them with a comfortable win in their first league outing in three weeks. With Ryan Billington and Marc Passey unavailable, Racers began with Rich Powell and Joe Smith in the full-back positions and Luke Cole in central midfield flanked by Martin Slevin and Sam Beasley. 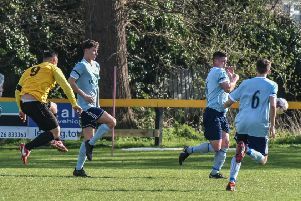 Cole fired home after just five minutes but instead of settling the hosts, it was Copsewood who looked the more likely to score the next goal. Former Racer Sean Kavanagh had the ball in the net in the 16th minute but was harshly adjudged offside. Copsewood continued to boss possession after the break but were hit on the counter in the 66th minute with Trea Bertie unselfishly squaring to Ben Mackey who controlled well and calmly fired home from the edge of the box. Four minutes later Wade Malley picked up the ball just inside the Copsewood half and powerfully drove forward before rifling the ball home. Mackey slots home from the penalty spot. With 15 minutes remaining, the effervescent Smith who had been moved into midfield, cut inside and was brought down. Mackey slotted home the resultant penalty after the keeper had moved early. Racing Club Academy players Jarrod Clamp and Madundo Semahimbo were introduced and both looked assured with Semahimbo going close on two occasions. The home side wrapped up the scoring in the 79th minute, with Martin Slevin’s corner superbly headed home at the far post by Sean Castleton. After seeing his side bow out of the FA Vase in disappointing fashion, Racers boss Scott Easterlow was delighted with the victory, if not the manner of it. “It’s always important after you lose a game to get back to winning ways as quick as you can so it was pleasing, said Easterlow. Racing Club, who are playing a friendly at Redditch tomorrow evening, return to league action on Saturday with a trip to Rocester.